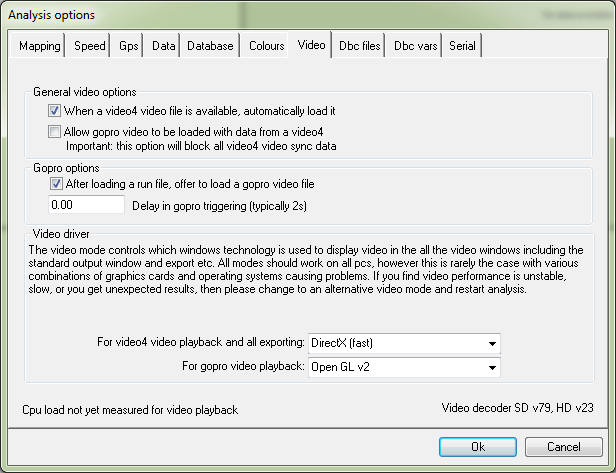 The first option controls whether when a VIDEO4 video file is located, whether it should be automatically loaded. If the video file is not loaded at the time that the run file is opened in analysis then it can be loaded manually using the run manager. More information is available here. The second option controls whether, when a run file is loaded, the software should automatically prompt the user to load a GoPro video file. There is more information about this option here. The options for the video driver are then given. Note that correct selection of the video driver is essential for the correct, reliable, and efficient operation of the software � but it�s very difficult to suggest which video mode is going to work best on a particular system. Generally most modes will work, but as to which is the �best� will require experimentation.